We only have two more markets this summer and then we will be done until the fall. Sadly, we are having a break from the corn harvest this week. That sometimes happens. Trust me, we are missing it too. However, there will be plenty of sweet corn next week at our last market. 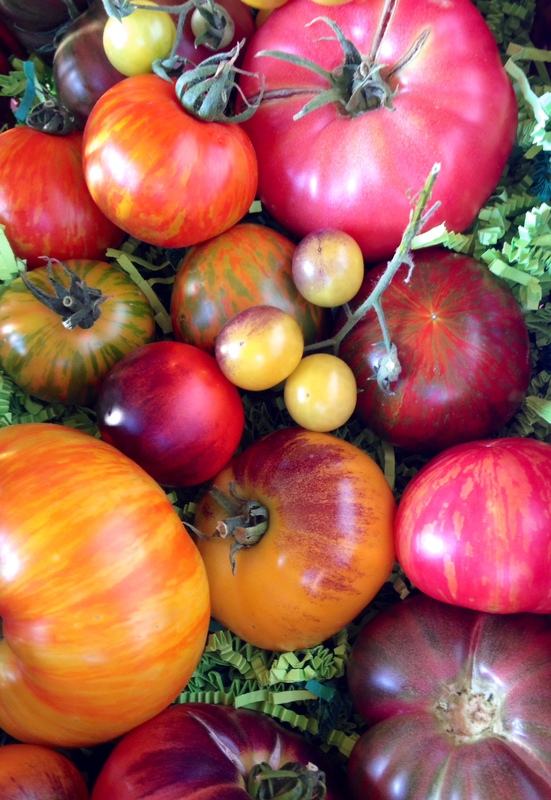 This week you will simply have to make due with our wonderful heirloom tomatoes. They are so flavorful that they have ruined me from eating any other tomato. Yes, they come in all sorts of crazy colors and have equally nutty names, but their flavor is unparalleled. You can dress them up, but really, why bother? Enjoy them simply to truly see how incredible they are. You can do what I did and make a panzanella with the Grain and Legume bread from Noble Breads. Break up the bread and toast for 2-3 minutes. Cut up a handful of tomatoes and add some shredded basil, a few splashes of a good olive oil, some sea salt and then let the flavors and juices all meld together for a few minutes until the bread has softened again. You can even spice it up with a little red onion or add some proscuitto and mozzarella. It is best of summer in one bowl. And it may help tide you over until we have corn again next week.